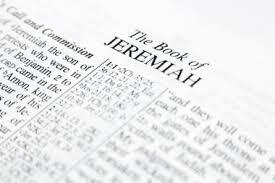 1 The Lord gave another message to Jeremiah. He said, 2 “Go down to the potter’s shop, and I will speak to you there.” 3 So I did as he told me and found the potter working at his wheel. 4 But the jar he was making did not turn out as he had hoped, so he crushed it into a lump of clay again and started over. 5 Then the Lord gave me this message: 6 “O Israel, can I not do to you as this potter has done to his clay? As the clay is in the potter’s hand, so are you in my hand. 7 If I announce that a certain nation or kingdom is to be uprooted, torn down, and destroyed, 8 but then that nation renounces its evil ways, I will not destroy it as I had planned. 9 And if I announce that I will plant and build up a certain nation or kingdom, 10 but then that nation turns to evil and refuses to obey me, I will not bless it as I said I would. Don’t forgive their crimes and blot out their sins. A wife is a good thing! “‘Even now, if you quit your evil ways, I will let you stay in your own land. 4 But don’t be fooled by those who promise you safety simply because the Lord’s Temple is here. They chant, “The Lord’s Temple is here! The Lord’s Temple is here!”5 But I will be merciful only if you stop your evil thoughts and deeds and start treating each other with justice; 6 only if you stop exploiting foreigners, orphans, and widows; only if you stop your murdering; and only if you stop harming yourselves by worshiping idols. 7 Then I will let you stay in this land that I gave to your ancestors to keep forever. 8 “‘Don’t be fooled into thinking that you will never suffer because the Temple is here. It’s a lie! 9 Do you really think you can steal, murder, commit adultery, lie, and burn incense to Baal and all those other new gods of yours, 10 and then come here and stand before me in my Temple and chant, “We are safe!”—only to go right back to all those evils again? 11 Don’t you yourselves admit that this Temple, which bears my name, has become a den of thieves? Surely I see all the evil going on there. I, the Lord, have spoken! 24 “But my people would not listen to me. They kept doing whatever they wanted, following the stubborn desires of their evil hearts. They went backward instead of forward. 25 From the day your ancestors left Egypt until now, I have continued to send my servants, the prophets—day in and day out. 26 But my people have not listened to me or even tried to hear. They have been stubborn and sinful—even worse than their ancestors. 30 “The people of Judah have sinned before my very eyes,” says the Lord. “They have set up their abominable idols right in the Temple that bears my name, defiling it. 31 They have built pagan shrines at Topheth, the garbage dump in the valley of Ben-Hinnom, and there they burn their sons and daughters in the fire. I have never commanded such a horrible deed; it never even crossed my mind to command such a thing! 32 So beware, for the time is coming,” says the Lord, “when that garbage dump will no longer be called Topheth or the valley of Ben-Hinnom, but the Valley of Slaughter. They will bury the bodies in Topheth until there is no more room for them. 33 The bodies of my people will be food for the vultures and wild animals, and no one will be left to scare them away. 34 I will put an end to the happy singing and laughter in the streets of Jerusalem. The joyful voices of bridegrooms and brides will no longer be heard in the towns of Judah. The land will lie in complete desolation. 7:15 Hebrew of Ephraim, referring to the northern kingdom of Israel. 1 “Run up and down every street in Jerusalem,” says the Lord. “Look high and low; search throughout the city! I will not destroy the city. 3 Lord, you are searching for honesty. 4 Then I said, “But what can we expect from the poor? 5 So I will go and speak to their leaders. a wolf from the desert will pounce on them. tearing apart any who dare to venture out. and their sins are many. For even your children have turned from me. They have sworn by gods that are not gods at all! I fed my people until they were full. and lining up at the brothels. leaving a scattered few alive. and said, ‘He won’t bother us! No disasters will come upon us. There will be no war or famine. who don’t really speak for him. and burn the people like kindling wood. they will devour your grapes and figs. which you think are so safe. and ears that do not hear. 22 Have you no respect for me? Why don’t you tremble in my presence? as an everlasting boundary that the waters cannot cross. but they can never pass the boundaries I set. 23 But my people have stubborn and rebellious hearts. They have turned away and abandoned me. 25 Your wickedness has deprived you of these wonderful blessings. Your sin has robbed you of all these good things. Worse yet, my people like it that way! 5:20 Hebrew to the house of Jacob. The names “Jacob” and “Israel” are often interchanged throughout the Old Testament, referring sometimes to the individual patriarch and sometimes to the nation. 1 Wake up, wake up, O Zion! the news that the God of Israel[c] reigns! 15 And he will startle[f] many nations. 52:5b Greek version reads The Gentiles continually blaspheme my name because of you.Compare Rom 2:24.